Bed rest includes scrapbooking, so I finished three layouts today. 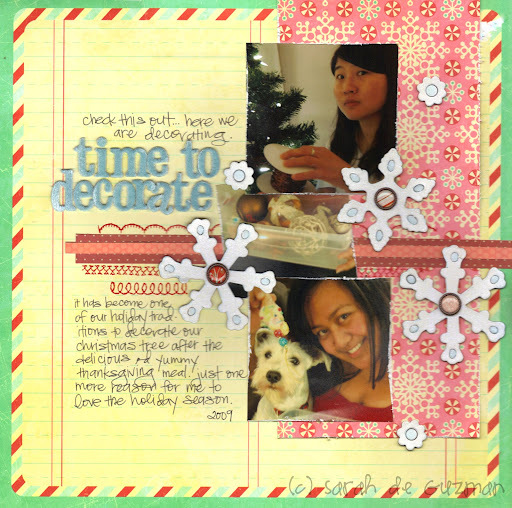 This first layout is a digital hybird layout created with Kiki Art papers and some fun fonts. I love the colors of this paper line. Aren’t they such girly fun colors?! These next two layouts were created just for fun. I used some of the sketches over at Sketchy Thursdays. Thanks for looking at my recent layouts. Back to bed rest and feeling icky sicky. Anyways, those are awesome los. You did an awesome job with the sketches. Take care and hope you feel better soon. Bed rest includes scrapbooking…hehehehe. Love the LOs and hope you feel better soon! So sorry to hear that you are sick – but even sick you are one incredible scrapper! Hope you feel better real soon! 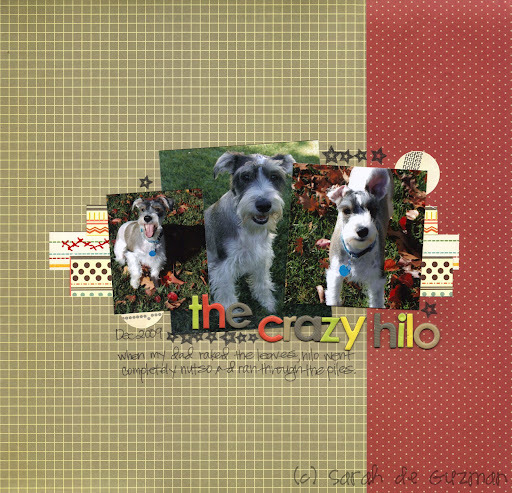 I love the hilo layout I might scraplift it. I need to update my scrapbook stuff so bad. Hope you feel better soon. Its a blizzard here. I love the decor by the way! I like your take on the sketch! I gave it a try also. Great layouts Sarah! I especially love that first one. You always seem to eat the yummiest things! LOL! BED REST INCLUDED SCRAPBOOKING! THAT IS HILARIOUS!!! All in the name of creativity, I tell ya! Hope you begin to feel better soon Sarah!! Poor girl, hope you feel better soon. Bummer! I am liking your bedrest though. While pregnant with DS I was on bedrest a lot, but required to be flat on my back! To bad you don’t feel that well, hope you will be better soon!!! Love the LO’s, aren’t the Scrappy Thursdays sketches fun to work with? You are quite the productive sick gal! Feel better very soon!!! 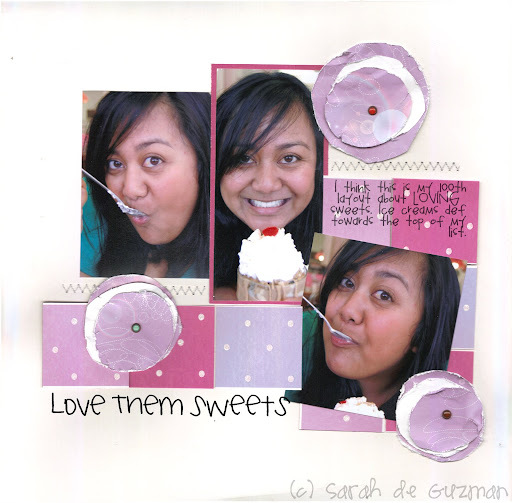 love these new layouts…they all have such a fun and clean look to them….i hope you GET WELL soon, sarah! I so ♥ all the LO’s… so cute & colorful & I always ♥ your hand-written journaling! he he! wow, you got lots done! i hope you feel better soon! here’s to a speedy recovery sarah!!! oh I know how you feel, but I have a long way to go. I love your sketch LO. such a great take. Oh Sarah…so sorry you don’t feel well at all! 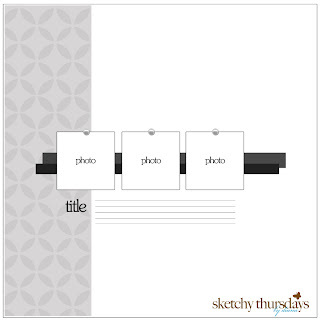 But wow..you have made gorgeous Layouts for Sketchy Thursdays…really beauitful!Congrats on the winning girl! And I got your sweet gift in the mail..LOVE it! Hope you feel better soon!Take care! Beautiful LO’s!!! I hope you’re feeling a bit better by now! Hope you get to feeling better…you have been sick way too much 😦 Love the layouts!!! !